Pakistan is currently prioritizing the development and deployment of short-range missile systems armed with low-yield nuclear warheads. This risky plan, which is part of an effort to deter conventional attacks from India, could lower the threshold for nuclear weapons use in South Asia. At the same time, Islamabad continues to develop and deploy longer-range ballistic missiles. The Shaheen-III, which at a range of 2,750 km is Pakistan’s longest-range missile to date, was tested for the first time in 2015. The Shaheen-III can reach Indian-controlled islands in the Bay of Bengal, in addition to all of mainland India. Pakistan continues to test other land-based missiles, such as the Shaheen-II, Ghaznavi, and Babur. Besides land-based systems, Pakistan is also developing a nuclear-capable air launched cruise missile, the Ra’ad, and is in the early stages of developing a sea-based deterrent. The National Development Complex is the main organization overseeing work on missiles, with a number of other entities involved as well. Pakistan appears to have made great strides in its ability to develop and produce missiles domestically. However, it remains reliant to a considerable extent on foreign sources for related equipment and materials. 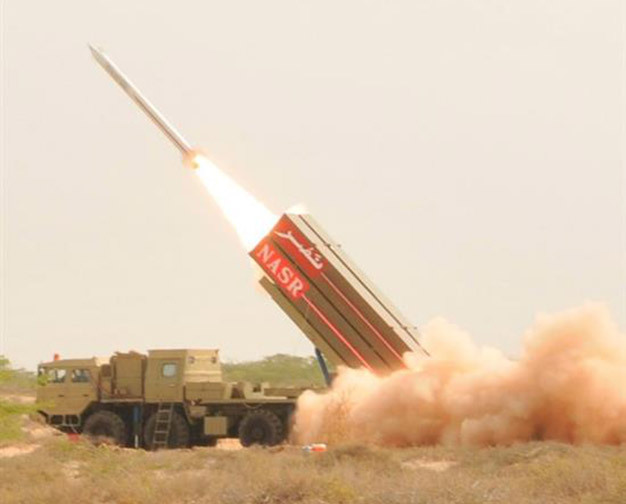 Nasr: In an effort to guard against India’s overwhelming advantage in conventional forces, Pakistan is developing tactical, nuclear-capable systems, such as the Nasr (Hatf-IX) short-range ballistic missile (SRBM). It was first tested in April 2011. Its most recent test, in September 2014, was done in salvo mode using a multi-tube launch vehicle (MLV). The road-mobile, solid-fueled Nasr has a range of 60 km and is equipped with “fire and forget” capabilities. Its main mission is understood to be to deter against a conventional attack by India. If it is deployed in the battlefield or along the Indo-Pakistani border during a crisis, it could increase the risk of a nuclear exchange between the two countries. Shaheen: Pakistan continues to enhance its series of Shaheen solid-fueled ballistic missiles. By April 2013, Pakistan had extended the range of the Shaheen-1 (Hatf-IV) from 750 km to 900 km. In April 2012 and December 2015, a test of the Shaheen-1A was conducted, an improved version of the Shaheen-1 with a range of 900 km and a reported payload capacity of 700-1,000 kg. The Shaheen-II (Hatf-VI), which was reportedly first tested in 2004, was first used by the Army in a training exercise in 2008. It was last tested in November 2014. This two-stage solid-fueled missile has a 2,000 km range and reportedly has a payload capacity of 1,000-1,100 kg. In March 2015, Pakistan conducted the first known test launch of the Shaheen-III ballistic missile. It was tested again in December 2015. This nuclear-capable missile has a range of 2,750 km. According to Lieutenant General (Retired) Khalid Kidwai, the former head of Pakistan’s Strategic Plans Division, the Shaheen-III is able to bring the Indian-controlled Nicobar and Andaman Islands in the Bay of Bengal, where Pakistan fears India may build “strategic bases,” within range of Pakistan’s nuclear arsenal. Ghaznavi: The first batch of Ghaznavi (Hatf III) ballistic missiles were reportedly inducted into the Strategic Forces Command in 2004. The nuclear-capable Ghaznavi is a solid-fueled missile with a range of 290 km and a reported payload capacity of 800 kg. Ghauri: The Pakistan military continues to conduct training launches of the liquid-fueled Ghauri (Hatf V) ballistic missile, which has already entered service. The nuclear-capable missile, which has a range of 1,300 km and a reported payload capacity of 700 kg, was tested again in April 2015. Babur: In October 2011 and September 2012, Pakistan conducted tests of the Babur cruise missile (Hatf-VII), which Islamabad describes as a nuclear-capable missile with a 700 km range. It is fired from a multi-tube launch vehicle (MLV), and has a reported payload capacity of 300 kg. Ra’ad: The Ra’ad Air-Launched Cruise Missile (Hatf-VIII) was last tested in January 2016. The Pakistani government claims that the missile can carry nuclear warheads to a range of over 350 km. It has a reported payload capacity of 450 kg. Pakistan hopes to develop a sea-based nuclear arsenal. In May 2012, Islamabad inaugurated the headquarters of the Naval Strategic Force Command, which was tasked with ensuring Pakistan’s “second strike capability” and “strengthen[ing] Pakistan’s policy of Credible Minimum Deterrence.” Such capability may include sea-launched versions of the Babur and Ra’ad cruise missiles, which might be carried on its diesel-powered submarines or even on surface warships. The National Command Authority (NCA), established in 2000 with the Strategic Plans Division (SPD) as its secretariat, has broad power over “all issues relating to nuclear and space technologies” in Pakistan, bringing all national strategic organizations under its authority. The NCA was created to increase institutional accountability within the nuclear establishment, develop a strong command and control system for Pakistan’s nuclear arsenal, and to increase its security. These initiatives have improved Pakistan’s command and control system, as well as the security of its nuclear arsenal. Pakistan has also been developing a Strategic Command and Control Support System (SCCSS) to improve command and control and allow for real-time monitoring of missile flights. The SCCSS was first used in a test of the Ra’ad ALCM in May 2012. The Missile Technology Control Regime (MTCR), a group of thirty-four countries (not including Pakistan) with common export control policies aimed at stemming the proliferation of WMD-delivery vehicles, is the world’s primary anti-missile proliferation tool. The MTCR guidelines forbid or restrict the transfer of most ballistic-missile related equipment and technology from participating states, a group that includes France, Russia, the United Kingdom, and the United States. China is not a member, although it claims to abide by MTCR guidelines. Member states have agreed on a “strong presumption” to deny transfers of MTCR “Category I” items, which are deemed the most sensitive. Included in this category are ballistic missile, cruise missile, and space launch vehicle systems capable of traveling beyond 300 km with a 500 kg payload, as well as sub-systems, facilities, and technology that support these systems. “Category II” contains less sensitive and dual-use missile related components, as well as missile systems with a range of at least 300 km, regardless of payload; participating states have greater flexibility regarding transfers of these items. The MTCR therefore remains an important obstacle to direct cooperation in ballistic missile development between Pakistan and the majority of the states which have advanced ballistic missile programs. The regime’s provisions create a set of “best practices” that work against the proliferation of WMD delivery vehicles. Many of Pakistan’s major missile developers and producers are on the “Entity List” maintained by the U.S. Department of Commerce, subjecting them to heightened export license requirements. This list includes the Advanced Engineering Research Organization (AERO), Khan Research Laboratories (KRL), Pakistan Atomic Energy Commission (PAEC), National Development Complex (NDC), and Space and Upper Atmosphere Research Commission (SUPARCO). Pakistan has revealed little officially about which organizations within its defense establishment develop and produce specific missile systems. However, reliable outside sources, including publically available intelligence assessments, have provided useful insight into the work of this secretive community. National Engineering and Scientific Commission (NESCOM): NESCOM oversees a number of entities involved in Pakistan’s missile program. It is also reportedly involved in the development of the Ra’ad, the sea-launched version of the Babur, and the Ghauri. Air Weapons Complex (AWC): A subsidiary of NESCOM, AWC reportedly developed the guidance systems for many of Pakistan’s major missile systems, and is reported to be involved in the development of the Ra’ad. It is also responsible for the development of cruise missiles and UAVs. Pakistan Atomic Energy Commission (PAEC): PAEC is reportedly involved in the development of a sea-launched version of the Babur. Space and Upper Atmosphere Research Commission (SUPARCO): SUPARCO, which oversees Pakistan’s space program, is reported to have assisted NDC in the development of the Shaheen-I and Shaheen-II missiles. Pakistan has made steady progress in developing its indigenous missile production capabilities over the decades. However, these capabilities were developed with extensive help from abroad, and Islamabad continues to rely on foreign entities for equipment and materials. The U.S. Central Intelligence Agency has reported that Chinese entities assisted Pakistan in the development of solid-fueled ballistic missiles, particularly the Shaheen series, and that through this assistance Pakistan became capable of serial production of solid-fueled ballistic missiles. In 2011, press reports described several sales or attempted sales by Chinese firms of equipment that could be used in Pakistan’s missile program. These transactions included: an illegal sale by the Chinese firm Polytechnologies of a coil-winding device and specialized optical chips to Pakistan’s Advanced Engineering Research Organization (AERO), an entity involved in the development of bombs and UAVs; a planned sale of machinery by the Chinese company Jinan Metal Forming Machinery Engineering Co. to Pakistani defense organizations; and an attempted sale of of specialty steel by a Chinese company to Pakistan’s Aginel Enterprises. This type of steel had previously been used for components of the Ghaznavi SRBM. In 2012, the U.S. Director of National Intelligence reported to Congress that Pakistan continued to receive “a variety of missile-related items” from Chinese entities, primarily private companies and individuals. U.S. intelligence has also reported that the Ghauri missile is derived from North Korea’s No Dong missile. In 2003, the United States applied sanctions to North Korea’s Changgwang Sinyong Corporation (aka Korea Mining Development Trading Bureau – KOMID) for exporting missile-related technology to KRL. Pakistani entities are also engaged in the procurement of missile-related equipment and technology illegally exported from the United States. In 2007, SUPARCO received 90 fixed coaxial attenuators from Nadeem Akhtar, a Pakistani national living in Maryland, which were shipped without the required authorization from the Commerce Department. That same year, SUPARCO received an unauthorized shipment of an atmospheric testing device and related equipment from the University of Massachusetts at Lowell. In recent years, SUPARCO also received unauthorized shipments of carbon fiber and microwave laminates from Bilal Ahmed, a businessman in Illinois. In addition, according to the Commerce Department, since 2010 AERO has been using a network of front companies and intermediaries to procure illicit items of U.S. origin for the development of missiles and UAVs. Some of these items were procured for AWC. This network is spread across several countries, including Pakistan, China, Singapore, and Australia. In 2014, Commerce identified eight companies as part of AERO’s network: Vortex Electronics (Australia), Beijing Lion Heart International Trading Company (China and Hong Kong), Future Systems Pvt. Ltd. (Pakistan), IKAN Engineering Services (Pakistan), LT Engineering and Trade Services (Pvt) Ltd. (LTE) (Pakistan), Nazir and Sons International (Pakistan), Orion Eleven Pvt. Ltd. (Pakistan), and Izix Group Pte Ltd. (Singapore).